Ilza's academic high schoool is the Nicolaus Copernicus High School (Liceum Ogólnokształcące im. M. Kopernika w Iłży, LO-Ilza). During the course of the Ilza Historical Cemetery Restoration Project we developed a very cordial relationship with the school principal, Mr. Cezary Ziembicki. .He told us that the curriculum includes Holocaust studies and that the students were interested in learning about their former Jewish neighbors. As part of the project to restore the Jewish cemetery in nearby Ożarów, Dr. Norman Weinberg created an essay contest with the local high school. Using this as a model, Barbara Sontz. established the Feldman Family Awards literary contest with the participation of faculty and students at LO-Ilza. The awards program was co-sponsored by the Polish Jewish Cemetery Restoration Project (PJCRP). Over 120 students from LO-Ilza participated in the first contest in 2005. Many of them working in teams, they wrote lengthy essays about the history of Jews in Ilza. Three prize winning essays were selected and translated into English. Awards were presented in a ceremony attended by the Office of the Radom District, the Mayor of Ilza and his staff, the Chairman of the Town Council and other key people of the Ilza Community, journalists and the PJCRP team. Student entries included essays, stories and poems; winners were selected in each of the categories. The Feldman Family Awards were presented on May 22, 2006 as part of the Ilza Cemetery Rededication Trip. More than 200 local residents attended the ceremonies. Click here to read the winning poems that received the 2006 Feldman Family Awards. Click here to read remarks made at the 2006 awards ceremony. Monika Dziwisz reads her First Prize poem at the Feldman Family Awards ceremony. A group of students at LO-Ilza produced and presented a play called First-Class Ticket. Originally written in Yiddish, the play was translated into English by the students. They set the play in Ilza to remember the Jewish families who lived there prior to the Second World War. 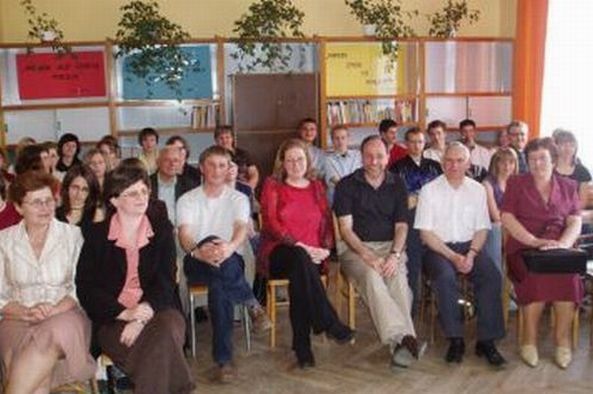 Representatives of the Feldman family visited LO-Ilza on May 23, 2006. Throughout the visit, Phil and Barbara were treated as honored guests. Barbara Sontz and Phil Mintz meet with faculty and students of LO-Ilza.